A vet check on Monday morning followed by some annual leave is in store for police dog Thames who is resting at home after seven nights missing on the tops of the Tararua Ranges. Thames was found early Sunday afternoon by his handler Constable Mike Wakefield and experienced volunteer searcher John McCann. Hungry, and a bit skinnier in the haunches after a week of foraging, Thames was fit enough to walk out to the Mt Holdsworth Road end about 5pm tonight, along with his very happy handler and the rest of the six person team. It was a big fresh paw print in the mud mid Saturday afternoon which gave Constable Wakefield and the SAR team a welcome boost as they systematically scoured the High Ridge area. Further fresh signs today near Flaxy Knob got the team further excited with Constable Wakefield and Mr McCann pushing on towards Powell Hut. The pair spotted Thames in the bush just before a clearing. “I whistled and called but he ran off as if to say come this way before running back and giving me a big lick. He said Thames looked better than expected after his adventures, and was fit enough for the four hour trek out to be greeted by Constable Wakefield’s family, colleagues, friends, members of the public and media. A precautionary vet check will follow for Thames and both he and Constable Wakefield will take a couple of weeks of annual leave to recuperate before they’re back on duty keeping people safe and catching offenders in Wairarapa. 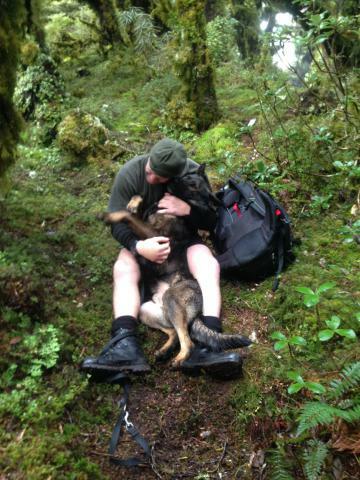 Photos attached: The moment Constable Mike Wakefield and police dog Thames are reunited in a bush clearing in the Tararua Forest Park.